Be the first to share your favorite memory, photo or story of Evangeline. This memorial page is dedicated for family, friends and future generations to celebrate the life of their loved one. Evangeline Barrow Naylor, 81, passed away on Wednesday, October 31, 2018 at Kitty Askins Hospice Center surrounded by her family. 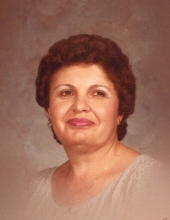 Evangeline was born in Greene County on September 30, 1937 to the late Samuel and Nolar Head Barrow. She was a valued employee of Cooper Bussman in Goldsboro. Evangeline was a member of Free Gospel Pentecostal Free Will Baptist Church. The life Evangeline lived, one of grace and Christian love, could not be diminished by the sickness that she endured. Her sweet smile and gentle ways will be remembered by everyone that knew her. The family will receive friends on Friday, November 2, 2018 from 1:00 – 2:00 p.m. at Seymour Funeral Home followed by a service to celebrate Evangeline’s life at 2:00 p.m. in the chapel. Interment will be in the Snow Hill Cemetery. At other times the family will be at the home of her daughter and son-in-law, Donna and Johnny Lawhorne. Evangeline is survived by her daughter, Donna Lawhorne and husband Johnny of Goldsboro; sons, Robert Keith Naylor and wife Barbara of Goldsboro and Timothy Scott Naylor and wife Tracy of Myrtle Beach; six grandchildren and seven great-grandchildren. She is also survived by her sisters, Myrtle McKeel of Snow Hill and Jean Newsome of Wilmington; and brother, Ronald (GooGoo) Barrow of Snow Hill. In addition to her parents, she was preceded in death by her brothers, Hodges Barrow, Wiley Barrow, Raeford (Buck) Barrow and Desmond (Hambone) Barrow; and sisters, Bertha Mae Head and Joyce Taylor. We would like to give a very special thank you to the wonderful staff at Kitty Askins Hospice Center for the love and care they provided for Evangeline during her final days. Simple words cannot express our gratitude. Also a thank you to the caregivers at Eagles Pointe who cared for Evangeline over the past year. Flowers are welcome or memorials may be made to Free Gospel P.F.W.B. Church, 145 Free Gospel Road, Snow Hill, NC 28580 or to the Alzheimer’s NC Inc., 9131 Anson Way, Raleigh, NC 27615. To send flowers or a remembrance gift to the family of Evangeline Barrow Naylor, please visit our Tribute Store. "Email Address" would like to share the life celebration of Evangeline Barrow Naylor. Click on the "link" to go to share a favorite memory or leave a condolence message for the family.